Snack Brands Australia (SBA) is one of Australia's leading snackfoods companies with well-established brands such as Kettle, Thins, CC’s, Natural, and Cheezels. SBA has grown tremendously throughout the years as a result of its continuous efforts on innovation, customer focus and operational efficiency. URC's acquisition of SBA has allowed the company to widen its premium portfolio. In addition, it has further expanded URC’s footprint in Oceania by providing a solid anchor in the highly competitive Australian FMCG and retailing market. Light, airy and irresistibly tasty. 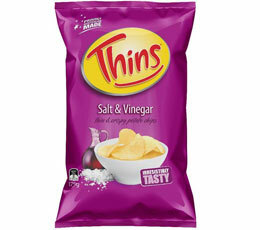 Australia's favourite thinly sliced potato chip!